Excerpt from a reproduction of John Evans’ A new and accurate plan of the Cities of London and Westminster and Borough of Southwark etc 1799, annotated to indicate lodges meeting in premises identified as being sited in or around the Strand between 1725 and 1825. More than one lodge might have met at a single venue over time. The history of freemasonry as a secular, fraternal organisation in England dates from the late seventeenth century, when several private lodges are known to have existed before four London-based lodges formed the first Grand Lodge in 1717. Another group of masons formed a rival Grand Lodge known as the ‘Antients’ in 1751, after which time the inaugural Grand Lodge became known as the ‘Moderns’ or ‘premier’. The two merged to form the United Grand Lodge of England and Wales (UGLE) in 1813, with the Duke of Sussex, a younger son of King George III, as Grand Master. This Union represented a period of standardisation, consolidating the basic administrative structure of freemasonry under the English Constitution – which continues to this day. Whereas others have researched the social, economic and artistic development of the Strand area and its inhabitants using eighteenth century ecclesiastical and civilian archives, to date few scholars have investigated the surprisingly rich resources to be found for this location among Masonic records. Rather than attempting a comparative topographical study of eighteenth century social life on the Strand, this paper aims to provide an introduction to the Masonic presence in this dynamic neighbourhood since 1717 and the archives created by such activities. Described in Elizabethan title deeds as “the High Street of Westminster, commonly called the Strand,” the area once served as the focus for river fronting mansion houses. ((From: ‘The Strand: Introductory and historical’, Old and New London: Volume 3 (1878), pp. 59-63. URL: http://www.british-history.ac.uk/report.aspx?compid=45133&amp;strquery=high+street Date accessed: 21 March 2011.)) Their illustrious owners provided names for the numerous alleys and courts that extended north and south from this narrow thoroughfare. ((Tudor residents who have provided names for the many courts, alleyways and thoroughfares leading from the Strand include the Norfolk, Arundel, Howard and Surrey families. ‘The Strand: Introductory and historical’, Old and New London: Volume 3 (1878), pp. 71. URL: http://www.british-history.ac.uk/report.aspx?compid=45133&amp;strquery=high+street Date accessed: 21 March 2011.)) Forming a pivot west and east between the cities of Westminster and London, by the eighteenth century the Strand had developed into a community of bankers, shopkeepers, transportation providers, printers, booksellers and traders. It attracted visitors from the theatrical, musical and legal neighbourhoods to the north and from the commercial hub of the River Thames to the south. Its built environment included several almost derelict mansions, numerous narrow Tudor tenements as well as new buildings erected by speculators or provided with updated elevations after the late 17th century Restoration. Many Tudor and Jacobean edifices in and around the Strand survived into the mid-nineteenth and in a few cases into the twentieth century. Into this milieu the four Adam brothers erected London’s first neoclassical housing development in 1768, the Adelphi Buildings, the epitome of enlightenment thought and cultural expression. Membership of a lodge was (and is still is) based upon strict moral standards encompassing brotherly love, relief and truth and includes participation in ceremonies incorporating symbolism and role-play, whose costume, drama and ritualistic myth-telling elements continues to attract many members. Such role-play became a feature of many other friendly and fraternal organisations, which often incorporated Masonic iconography to decorate artefacts associated with their material culture. ((For further information about identifying material culture of friendly and fraternal societies see Discovering Friendly and Fraternal Societies: their badges and regalia, by Victoria Solt Dennis, Discovering Series No. 295 Shire Publications, 2005 ISBN 0747806284 and for additional Masonic degrees, such as Knights Templar, see Beyond the Craft, by Keith Jackson, Addlestone, 4th edition 1994)) Although many clubs and friendly and fraternal societies have adapted original remits over time, freemasonry remains the largest fraternal membership organisation. In addition Clark calculated that Moderns’ Lodges in London each attracted on average about twenty members in the first quarter of the eighteenth century but by the 1760’s this had increased to c.33 members. ((British clubs and societies, 1580-1800: the origins of an associational world, Peter Clark, Oxford, Clarendon Press, 2000, p310.)) These estimates may not always represent unique individuals as members frequently joined more than one lodge. A preliminary investigation has revealed that between c.1725 and 1825 at least 57 Lodges met in Strand-based taverns, inns, coffee houses and in one case in a private room at Somerset House. 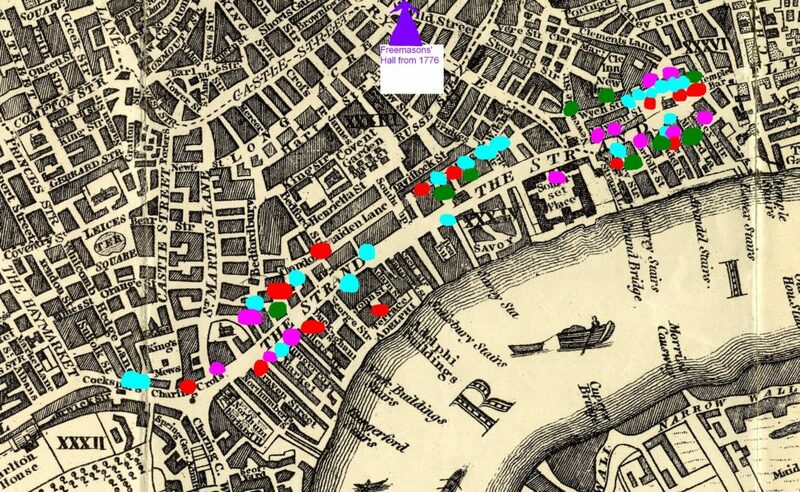 ((See Appendix 1 – data on lodges meeting in the Strand and adjoining areas is derived from Lane’s Masonic Records on-line database, see http://freemasonry.dept.shef.ac.uk/lane/)) Plotting known locations for meeting places along and around the Strand provides some early indications that by 1750 most lodges favoured hostelries offering accommodation in Butcher Row or Holywell Street. Several transferred to inns in more refined areas further west by the end of the eighteenth century, before returning to premises nearer the eastern boundary of the Strand during the early nineteenth century. ((For a plan see Appendix 2.)) Although Freemasons’ Hall opened not far to the north in 1776, it did not affect the regular pattern of seventeen lodges on average meeting in premises in or around the Strand during this century. After space at the new Hall became available for hire, this was too large for most lodges in the Holborn area that continued to meet in cramped rooms at the adjoining Freemasons’ Tavern. Additional research using other resources available at the Library and Museum of Freemasonry may reveal details for other lodges meeting in the Strand area. ((Further research among other primary and secondary resources in the collections of the Library and Museum of Freemasonry, such as annual returns of members to Grand Lodges, membership registers, printed lists of lodges, lodge histories, historical correspondence, lodge minute books (Often in the custody of the lodge if still meeting) etc, as well as searching meeting locations in all the courts and streets joining the Strand in Lane’s Masonic Records, would reveal details for other eighteenth century lodge meetings places.)) Some met at the same premises for many years whereas others relocated to alternative venues nearby or elsewhere in London. For example, Manchester Lodge met at a succession of premises in the area for over a half a century, including the Crown, Essex Street; the Swan, Butcher Row; the Sun, St Clement’s Inn Foregate, before relocating to the Crown and Anchor Tavern. This last venue, rebuilt in 1790, offered a variety of meeting spaces and formed a popular home for political meetings and several other societies and no fewer than six Masonic Lodges. Therefore given the membership estimates compiled by Clark from various primary and secondary resources it is possible to extrapolate that during the long-eighteenth century approximately 1,250 members attended Lodge meetings in or near the Strand. ((British clubs and societies, 1580-1800: the origins of an associational world, Peter Clark, Oxford, Clarendon Press, 2000, p310, with particular reference to its footnote 7.)) Throughout the eighteenth century, members of a Lodge met usually around a trestle table, with the formal meeting or rehearsals interspersed by numerous toasts followed by a meal in the same room. Soon after the merger of the Moderns and Antients to form the United Grand Lodge in 1813, the format of lodge meetings and ceremonies were regularised. Food, alcohol and tobacco were banned from a formal Lodge meeting and all social dining and entertainment was restricted to what became known as the Festive Board, which took place elsewhere in the establishment or at another venue. ((The History of English Freemasonry, John Hamill, Lewis Masonic Books 1994, Chapter 5 The Social Side, pp90-91.)) Several lodges remained loyal to venues on or near the Strand, some meeting in that locality as late as the mid nineteenth century, before moving to hotels offering exclusive meeting rooms decorated especially for Masonic purposes, known as temples. Despite numerous changes since the eighteenth century members today would still recognise the remarks made at the end of a Lodge meeting that it was closed ‘with feelings of true harmony and brotherhood’. In conclusion this article aims to raise awareness of the wealth of social and topographical information accessible from secondary and primary resources such as Masonic periodicals, lodge histories, membership registers, annual returns, historical correspondence held by the Library and Museum of Freemasonry. Further research among these resources, yet to be fully exploited by those interested in London’s topographical and social history, is required to uncover further information about eighteenth century Strand inhabitants and visitors.